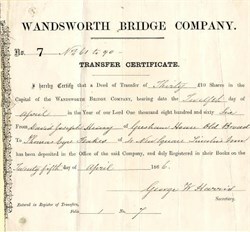 Beautiful certificate #7 from the Wandsworth Bridge Company issued in 1866. This item has the signatures of the Company's Secretary, George W. Harris and is over 148 years old. Wandsworth Bridge crosses the River Thames in London in a North-West to South-East direction. It joins the areas of Battersea, near Wandsworth Town Station, in the London Borough of Wandsworth, on the South of the river, to the areas of Sands End and Parsons Green, in the London Borough of Hammersmith and Fulham, on the North side. Wandsworth Bridge is on the A217 route and is the busiest bridge in London (by numbers of vehicles crossing daily). The first Wandsworth Bridge, designed by Julian Tolme was opened in 1873 and featured five cast iron spans on iron based piers with brick abutments. By 1880 a five ton weight limit was imposed on the bridge and a decision taken to replace it. However, it was not until 1935 that work started on the current structure, by Sir T Peirson Frank, which opened in 1940. This is a three span steel and concrete cantilever, 197 metres long. It was widened in 1970. For motor boats an 8 Knt. speed limit exists upstream of this bridge, as well as in adjoining creeks to the river.